It is that time of year when a birder must keep at least one eye on the skies for migrating raptors. 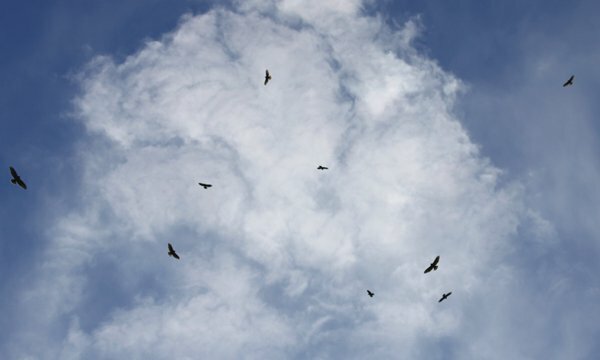 They make their way south in big numbers, especially on days when the winds are right, which generally from the north, though they do tend to pile up very nicely at many hawkwatch sites in the northeastern United States when the winds are out of the northwest. And of all the migrating raptors in the northeast Broad-winged Hawks are the ones most likely to be seen in huge numbers. I have not seen huge flocks of Broad-winged Hawks this fall, mostly because I have not gotten myself to a hawkwatch site. I have, however, seen flocks of twenty-plus birds a couple of times at Van Saun Park in Paramus, New Jersey, when I stop for some birding on my way to work. I believe that the birds that I see stopped the day before in the vicinity of the Palisades, the cliffs on the west side of the Hudson River in northern New Jersey, and what I see is the continuation of their migration. There is still quite a bit of forest along the Palisades and the days I have seen them are days after a day of northwest winds, which makes me think that they migrated their way south until hitting the Hudson. Not wanting to cross such a large river to their east they settle in for the night and make their way southwest when morning comes. Of course, I am hardly a hawk-migration expert so I could be completely off base here but I think my theory makes sense. Hawks and other raptors kettle where there is an updraft. They use rising air to gain altitude before leaving the updraft to glide to the next updraft, which they try to reach without expending energy by flapping their wings. 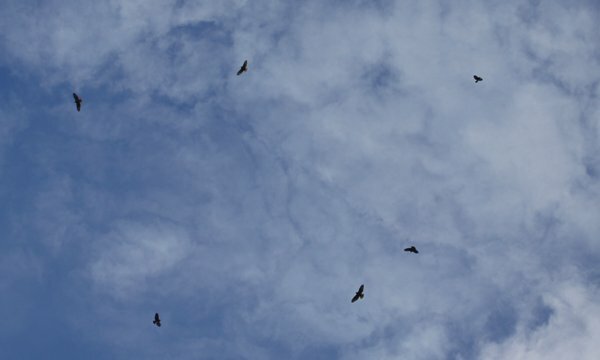 It is an extremely efficient method of migration and broad-wings, as their common name might imply, are pretty darn good at catching the rising air and soaring upward upward upward until a bird that you first spotted just above treetop level is little more than a speck without your binoculars. 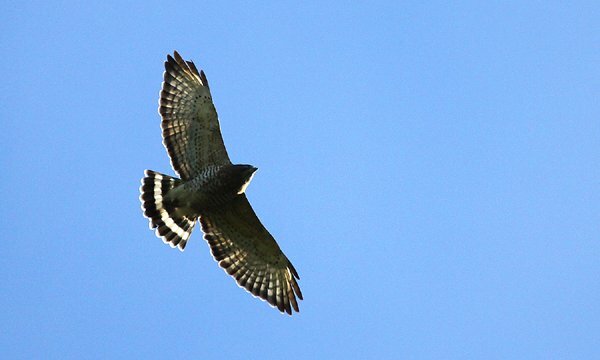 A recent study attached satellite transmitters to the backs of four Broad-winged Hawks and followed them as they migrated south in the fall. The hawks migrated an average of 7,000 km (4,350 mi) to northern South America, and traveled an average of 111 km (69 mi) each day. Once at the wintering grounds, the hawks did not move around much, staying on average within 2.6 square km (1 square mi). In North America Broad-winged Hawks are extremely rare after autumn as they all migrate south unlike other buteos like Red-tailed Hawk or Red-shouldered Hawk, some of which stay up north and battle the elements. Broad-winged Hawks are pretty easy to identify with their buteo form, their boldly striped tail, and the dark trailing edge of the wing. If it is autumn, you are in the northeastern United States, and you see a whole bunch of buteos kettling together you can almost guarantee that you are seeing Broad-winged Hawks. Get out there and look for some Broad-winged Hawks, one of the many marvelous spectacles to see in the autumn. If you don’t get out there soon you won’t get to see any until next year! That last back lit shot with the flight feathers and tail all lit up is super Corey! I got my first look at this beautiful raptor last weekend at the Marin headlands as part of Golden Gate Raptor Observatory’s Hawkwatch 2012! Lake Erie Metropark, boat launch.